If you're under 18, an adult will need to complete this application process and pay for you. 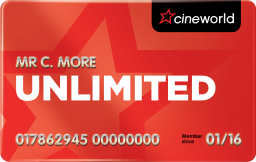 Where can I use my Unlimited card? You won't be able to use your card at London West End cinemas if you select this option. This photo will be printed on the Unlimited card and used for identification and fraud prevention purposes. We all love surprises but please ensure you have the member’s consent to give us their details before you complete this application form. An email will be sent to the new member to let them know you have bought this for them and to tell them all they need to know about their new Unlimited membership. You can adjust your cookie settings at any time at the bottom of each page. If you do not adjust your settings, you are consenting to us issuing all cookies to you.